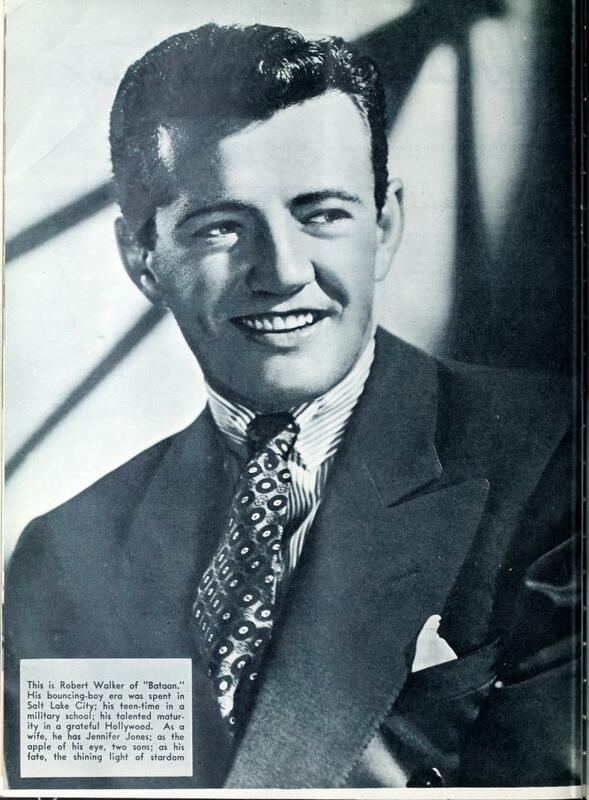 Today's star is Robert Walker. Here he is in a lovely portrait for Photoplay magazine. TCM is celebrating the career of Robert Walker with 12 movies on Aug. 9. Here's what you need to know about a talented actor who died too soon. FYI: TCM sometimes changes the air times and /or movies, so you can go to www.tcm.com to check the updated schedule. Born: Oct. 13, 1918, in Salt Lake City. Died: Aug. 28, 1951, in Los Angeles. Walker is buried in Washington Heights Memorial Park in Ogden, Utah. Brief bio: Walker had a difficult childhood after his parents divorced when he was young. One of Walker's aunts took him under her wing. She encouraged his interest in acting and even paid for Walker's tuition to the American Academy of Dramatic Arts in New York. While there, he met actress Jennifer Jones. They married in 1939 and moved to Hollywood where Walker's charming personality and boyish good looks quickly earned him a contract with MGM. Walker made his mark by playing fresh-faced boyfriends and soldiers in films like Bataan (1943), The Clock (1945), and See Here, Private Hargrove (1944). The break-up of Jones and Walker's marriage in 1945 affected him deeply, triggering problems with alcohol that would stay with Walker for the rest of his life. Despite his troubles, Walker continued to work steadily. He earned great acclaim for his role in director Alfred Hitchcock's Strangers On a Train (1951), but, sadly, he died a few months after the film's release of heart failure. 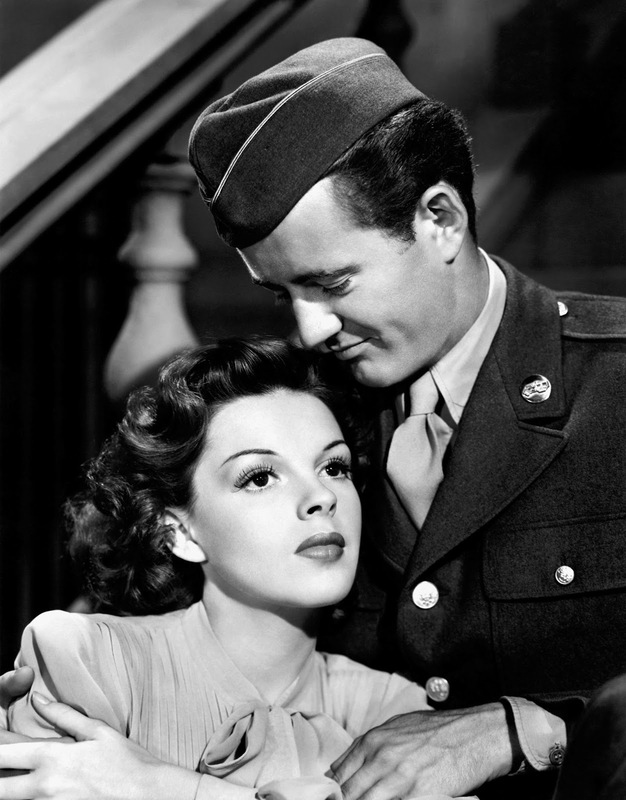 Judy Garland and Robert Walker in The Clock (1945). Fun fact: Walker was the original choice to play the role of the boy next door in Meet Me in St. Louis (1944), but Tom Drake eventually won the part. Signature role: Creepy mama's boy Bruno Antony in Strangers On a Train. 1. The Clock, airing at 6:15 p.m., has long been treasured by Judy Garland fans, but Walker is great too as a G.I. who has a whirlwind romance before he must leave for the front. 2. It's so sad that Walker died shortly after the release of Strangers On a Train, airing at 8 p.m.. His role as a psycopath who torments Farley Granger completely revolutionized his career, and he could have gone on to become one of the most sought after actors of the 1950's. 3. Her Highness and the Bellboy (1945), airing at 2 p.m., isn't exactly Citizen Kane, but it's still a fun comedy starring Walker as a lowly hotel employee who is enamored by a visiting princess (Hedy Lamarr). A great film not featured on Summer Under the Stars: Since You Went Away (1944) is an excellent ensemble drama about life on the home front during World War II. Walker plays a soldier who conducts a bittersweet love affair with a young woman, played by his then wife, Jennifer Jones. Fan Magazine Flashback: Walker and many other stars celebrate MGM's 15th anniversary for a photo shoot for Modern Screen magazine. The top photo features from left to right Tom Drake, Greer Garson, Peter Lawford, and Walker. 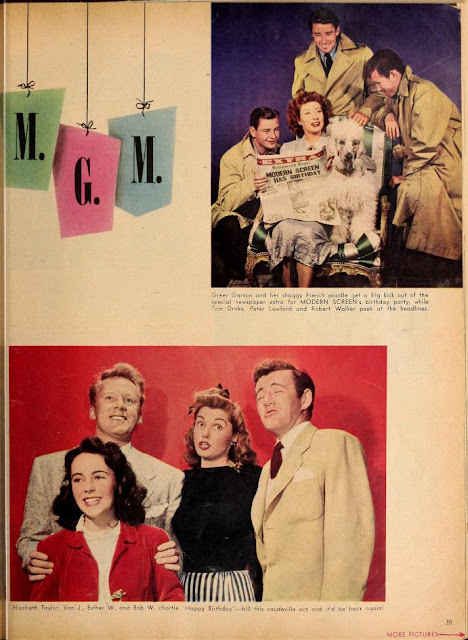 The bottom photo features Elizabeth Taylor, Van Heflin, Esther Williams, and Walker. Courtesy of the Media History Digital Library. My look at the film noir elements in Strangers on a Train. Walker played the rebellious son of Spencer Tracy and Katharine Hepburn in The Sea of Grass (1947). For more Summer Under the Stars articles, go here. There'll be plenty more on Walker on social media. Follow me on Tumblr, Google+ or Pinterest or like us on Facebook. Follow us on Twitter @oldhollywood21.